Clovis Point from Wupatk National Monument. Click the image to open the Clovis gallery. Geographical Range: Widely distributed across North America. Date Range: North America: 13,500 – 12,800 cal. BP (Fiedel 1999); Southwest: 13,280 – 12,660 cal. BP (averaged calibrated radiocarbon dates, Vance 2011:Appendix D). Size: Range: 25 to 150 mm; Average: 50 to 75 mm. Shape: Lanceolate, with somewhat excurvate sides contracting slightly at the base; straight, slightly expanding/contracting, or gently recurved lateral margins also occur. Cross-section: Lenticular, but flattened through the flutes (bi-concave). Base: Concave; occasionally straight; often auriculate (eared). Flaking: Overshot (outrepassé – flakes that pass well over the midline and often remove a portion of the opposite margin) and direct percussion flaking are most common, although pressure flaking is also sometimes recognizable on Clovis points. Flake scars are often widely spaced and alternating, either horizontally or diagonally, but can also be random. Fluting: On one or both sides; rarely extending beyond the half the point’s length and often ending in a hinge fracture. Flutes are often paired with end-thinning scars. Grinding: Heavy on lateral and basal margins. Materials: Typically high-quality cherts/flints/jaspers, chalcedony, obsidian, and other stone types. 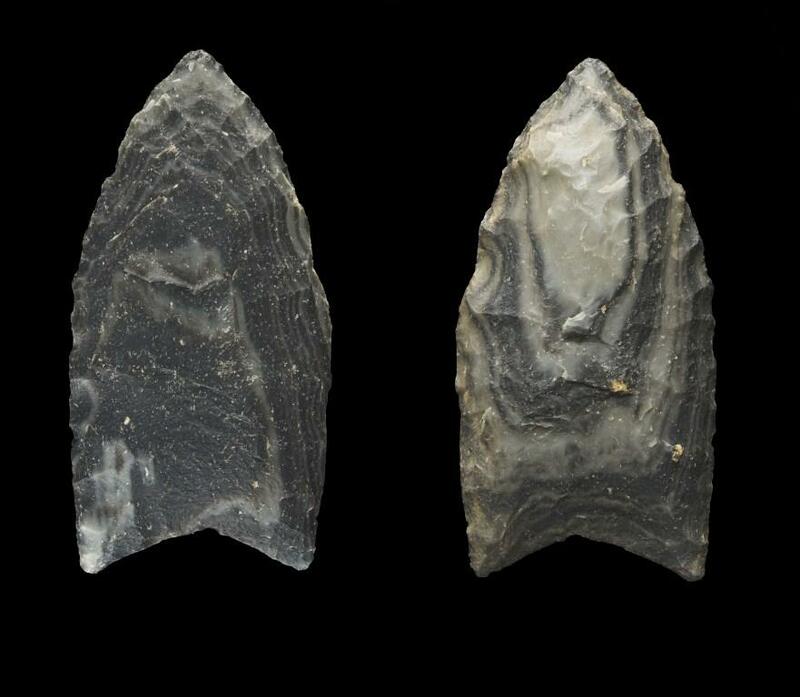 Comparisons: Clovis points tend to be thicker and heavier than other fluted points. Folsom points tend to be more finely made, are thinner, and have flutes extending from the base nearly to the tip of the point. Bradley, Bruce A., Michael B. Collins, and Andrew Hemmings. (2010) Clovis Technology. International Monographs in Prehistory, Archaeological Series 17. Ann Arbor. Fiedel, Stuart J. (1999) Older than We Thought: Implications of Corrected Dates for Paleoindians. American Antiquity 64(1):95-115. Morrow, Juliet E. and Toby A. Morrow. (2002) Exploring the Clovis-Gainey-Folsom Continuum: Technological and Morphological Variation in Midwestern Fluted Points. In Folsom Technology and Lifeways, edited by In J. E. Clark and M. B. Collins, pp. 141-157. Special Publication No. 4: Lithic Technology. Department of Anthropology, University of Tulsa, Oklahoma. Vance, Meghann M. (2011) Stones without Bones: Reconstructing the Lime Ridge Clovis Site. M.A. thesis, Department of Anthropology, Northern Arizona University, Flagstaff.